← How to convert html to pnm format? When you use VeryPDF docPrint to add ellipse comment on current before you sent a file to a printer, you can also edit ellipse comment on current page in docPrint preview application. You can edit ellipse comment including move the ellipse, cut, delete, copy the ellipse, set the ellipse to the background or foreground, lock the ellipse, or change the properties of the ellipse. 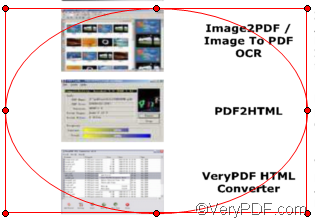 The following part of this article will show you how to edit ellipse comment in VeryPDF docPrint preview application. Assuming you have added an ellipse on the page in the Annotate Document dialog box, after you press the View Document button to view the page, you decide to edit the ellipse on current page. First, you need to click the comment button to make all the buttons on the toolbar in the Annotate Document dialog box be with color. Then click the ellipse comment button . To move the ellipse, you can press the left key down with the mouse and move the ellipse to wherever you like on current page. To adjust the size of the ellipse, you can move the mouse to one of the corner of the rectangle, then, when you see a cursor which is a line with two open arrows, you can press the left key of the mouse down, and drag the rectangle to adjust the size of the ellipse. You can choose Cut or use Ctrl+X to cut the ellipse comment; choose Copy or click Ctrl+C to copy the selected ellipse to the clipboard and choose Delete or press Delete key on the keyboard to delete the selected ellipse. Though there is no paste option on the menu, you can still paste the ellipse from the clipboard to the current page by pressing Ctrl+V. In addition, if you want to select a ellipse comment from many overlapped comments on current page, and set the selected ellipse to be a background, you should choose Set to Background. On the contrary, if you want to set the selected ellipse to the foreground, you should choose Set to Foreground. Further more. if there are too many comments on the current page, which makes it not easy for you to edit a ellipse comment, you can choose Lock/Unlock to lock the other irrelevant comments on current page. 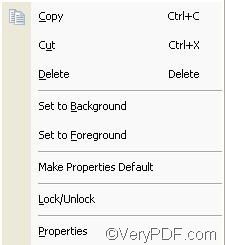 If you click Properties, you can open the Properties dialog box to set the line’s properties. In order to save the properties you have set on current page, you should choose Make Properties Default. To get more information about VeryPDF docPrint, please visit http://www.verypdf.com/artprint/index.html . You can also download the free version of VeryPDF software. If you want to read more articles about how to use docPrint, please visit http://www.verypdf.com/wordpress . How to convert documents of Microsoft Office PowerPoint to AVS? This entry was posted in docPrint Pro and tagged edit ellipse. Bookmark the permalink.